I love to cook, and every so often, I toy with the idea of starting a food blog. I even went so far as to register a domain name for a food blog I planned on starting with a foodie friend. I just paid the second year of registration to hold the name, but we still have no blog. Here’s why. 1) I am starting to recognize the “new project” excitement that leads to lasting and good things, like this blog, and the “new project” excitement that leads to a project that I start and then abandon, like making my own Nakashima-esque table. I have a sneaking suspicion that a food blog might of the latter variety, and would run out of steam once I blew through the ten fancy things I make on the regs. 2) I don’t take photos of food. Well, sometimes I do, but I take them on my phone. Poorly. No stunningly styled photos in which the fork sits just so, sparklingly clean in the professional lighting. Nope, blurry photos on my phone, through a lens smudged by my sunscreen-covered fingers, on my basic everyday dishes on a table with permanent marker marks and glitter glue residue. (FYI, glitter glue isn't washable like regular glue.) Or I forget altogether until I’ve eaten a few bites and messed up the pretty drizzled things. 3) I steal recipes. Sure, I have some things that are all mine. My chicken wing dry rub. The polenta appetizers I made this past weekend. My fruit crisp topping. The crème brulee with ganache that I sort of reverse engineered and then perfected after having it at a restaurant. Those are officially “my” recipes. But mostly, I’m stealing stuff from other food blogs I follow or find on Pinterest or making stuff with recipes my mom invented/perfected. 4) Failures are funnier than successes. If I had a food blog, how would I not show you this cake I made? I mean, come on, that’s blogging gold. A gluten-free carrot cake. My first time making carrot cake. My first time working with gluten-free flour. 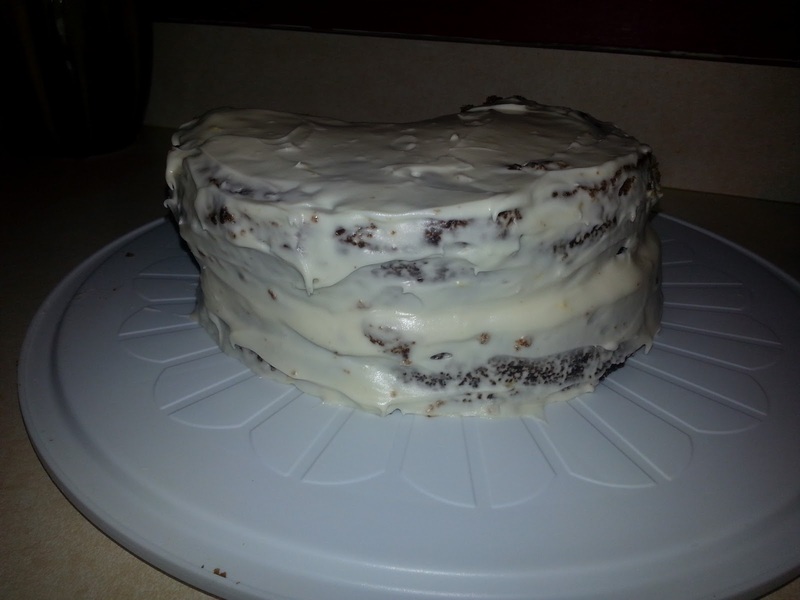 And my first layer cake in, let’s say… ten years? I forgot the basic rule. Make sure you have enough damn frosting to hide the mistakes. Oops. My gluten free baking masterpiece. No, the kids didn't help. This is all me, people. And how would I not talk about how I made this cake the morning after a bout of food poisoning, on 4 hours of sleep because I was up all night violently and variously expelling food from my body? And how would I not describe the swearing, ohhhhhh the swearing, as I was already running an hour behind for the dinner party I was co-throwing with a friend at her house, feeling sick and clammy, on no sleep, and this damn effing cake just kept crumbling and I didn’t have enough frosting and F**K!!!! What was I saying? Oh right, reasons why I don’t have a food blog. So anyway, those are the reasons. But, I do love food. I love to experiment with food and make delicious things, and I even like to photograph food poorly. So if it’s OK with you guys, I might do some food-related entries. They’re far more likely to be comedic failures than Pinterest-worthy masterpieces. I guess that’s just who I am. Coming off of a delightful dinner party with spectacular food, wine, cocktails, and company, the story I find I want to tell is one of food poisoning and the world’s most hideous cake. Maybe that makes me negative. I prefer to think of it as amusingly real.